New City were sent to the bottom of Four Counties Division 1 after a nail-biting defeat at the hands of Milton Keynes on Saturday. After a stuttering start to the innings, Mihir Choksi (71) and Manjit Singh (57) salvaged the innings somewhat but New City were bowled out for 207 as Grant Ebrahim took 5-48. The reply was equally as inconsistent for MK. 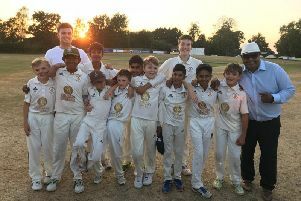 Despite losing three of their top five for ducks, Ebrahim (52) and Sam Hagger (46) gave the home side a fighting chance. But down to their last wicket, it was a nervy finale as Brian Tompkins (18 not out) and Joe Fairbrother (1 not out) hit the winning runs to take the win. It sends New City to the bottom of the pile, while MK are fourth, well in the mix. Four points separate second and sixth, and Westcroft (181) are right in that mix after another close encounter, this time against North Crawley (177) as Iqbal John took 5-25. Kieran Lampard’s 52 helped guide New Bradwell (138-6) to a four wicket win over Great Horwood (135) to stick around the middle pack. Olney Town though lost ground as they lost to Eaton Bray by five runs. Wes Hosking’s 107 put Bray on top at the change, scoring 263-8, with Iain Keeping taking 4-69. But despite coming close, Olney (258-8) narrowly missed out on the win.